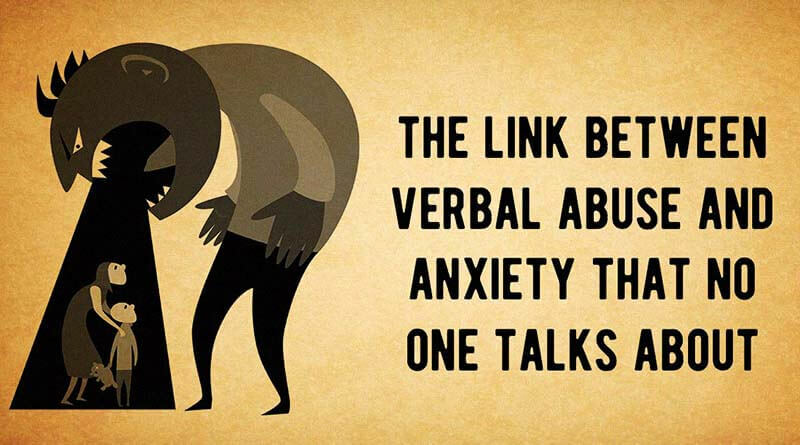 The Link Between Verbal Abuse And Anxiety That No One Talks About - ShareIt! Developing anxiety is something that stems from long-term mental abuse. All of the traumatic experiences that you have been through result with developing certain mental disorders, and having trouble with anxiety is just one of them. Verbal abuse is the most unreleased form of abuse that exists. There is so much stigma regarding this form abuse, and lots of people don’t really believe that it is legitimate. Sadly, because of this, the results from the abuse are as detrimental to one’s health as actual physical abuse and even worse at times. Yelling, and insulting someone when you are mad can do lots of damage to a person, and not a lot of people pay attention to the side effects of this kind of behavior. It doesn’t matter where it stems from, whether it’s cyber or real-life bullying or any other form of abuse that involves verbal abuse is equally as bad. This is because science claims that verbal abuse actually influences both the left and right brain hemisphere. If the abuse is ongoing and regular for a certain amount of time, especially starting from a young age, with this damage, a number of issues can develop. Both emotional and verbal abuse are actually connected. This is because when someone gets abused verbally, the damage is done because that gets to the person on an emotional level. This can damage someone’s self-esteem and overall confidence. The general mental development of a person can be largely negatively influenced due to these traumas, and that’s definitely something none of us want for ourselves, our loved ones, or anyone else for that matter. Anxiety can influence someone completely to the point where it interferes with a person’s relationships, and work. If you start noticing that some of your loved ones, friends, or even acquaintances in your life start dramatically changing their behavior, make sure to take notice and do your part in helping them get through it. Sometimes just a little bit of guidance and telling them where to go and what to do is more than enough. Usually, the people who have the tendency to abuse someone verbally use name calling as a tactic that helps them manipulate and give people orders to do something they want to. It is a very dangerous and damaging habit. Most of the abuse happens in a closed environment. Whether it’s someone’s home, school, or any other type of facility, this is where most of the abuse happens. It can cause severe trauma and damage a person immensely. The people going through verbal abuse often isolate themselves from socializing and overall from being around people. This makes them uncomfortable, and they get anxiety when they’re around someone. This stems from the low self-esteem. Make sure to speak to them and ask how they’re doing. If you are suspicious of someone, whether it’s a family member, friend, or someone from work or school, make sure to speak out. Start by talking to the person. You can make a huge difference if you help someone out who is going through verbal abuse. Abusers tend to never appreciate the person’s hard work and all of their accomplishments. To them, everything the person does is not good enough and is never anything special. This leaves you feel empty and without a purpose. Usually, abusers tend to feel like they’re losing all of the control of you when you’re a little higher in spirits and are feeling good. That’s the perfect timing when they start developing their tactic into how to make you feel bad again. It’s important to be aware of this and never let them achieve their goal. Abusers feed off of someone’s unhappiness and insecurity. Making jokes at someones expense may appear to be fun and innocent, but it should always be done with the consent and permission of the person. If this continues on, the person might be left feeling frustrated and worthless. Abusers have the tendency to put the attacking of the person’s interests, hobbies and overall things they like. This can make the person like they lack value and like they’re not good enough, which pushes them to develop the tendency to also lie about things of this sort. If you notice similar behavior make sure to act on it. Make it fast. Sadly, most abusers almost never apologize or even acknowledge their wrong doings in the first place. To them, they are always in the forefront and are always right about everything. If you notice and are a witness of this type of verbal exchange, and if you spot an abuser by ending the topic because they don’t even want to discuss, you may are witnessing signs of regular abuse. Abusers always blame the person for whatever reason in whatever situation. This make the person feel like they lack in worth and like they’re no good. This is terrible and detrimental to their health.